The TGML provides access for public research and business to functional genomics studies using a wide range of experimental and bioinformatic methods. The platform "Transcriptomics and Genomics of Marseille-Luminy" (TGML) is integrated into the laboratory "Theory and Approaches of Genomic Complexity" (TAGC, Pr. Pascal Rihet, UMR 1090, Inserm / Aix-Marseille University) Of Luminy. The platform has been labeled as a National Platform by GIS IBiSA, previously RIO, and is a founding member of the National Infrastructure for genomic analysis and bioinformatics France Génomique. The TGML platform and the TAGC provide a recognized expertise in the analysis of different types of DNA chips and sequencing data. Our researchers and engineers actively contribute to the development of new tools for integrated analysis and processing of genomic, epigenomic and transcriptomic data. Genomics: Targeted re-sequencing, complete exome, SNV, small / large IndDels, etc. The high-speed sequencing service is equipped with an Illumina NextSeq-500 sequencer and all the equipment and controllers needed to prepare the libraries. The NextSeq-500 can produce up to 120 gigabases (Gb), from 130 to 400M reads, in single-end (from 75 to 300nt) or pair-end reads (from 75 to 150nt), up to 96 samples per session. The Agilent DNA chip service allows transcriptomic studies of many organisms. It also allows miRNA, CGH, and analysis of DNA methylation profiling. Platform staff can provide sample preparation advice and follow-up on selected projects. Users can benefit from the services offered by the TGML as a service or collaboration, on the basis of a predefined contract. 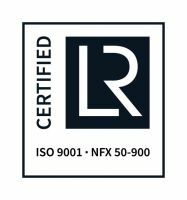 The entire activity of the platform is certified ISO 9001:2015 and NFX 50-900:2016. You can download the quality policy document here. GIS IBiSA, Cancéropôle PACA, CoReBio PACA, Plateforme technologique AMU (see charter). If you want to Submit a service request, Click here !